Simmer the potatoes in lightly salted water for 15 minutes, or until tender. Drain and mash thoroughly, preferably with a ricer. Beat in the butter and 2 egg yolks then finally the cheese and season to taste. Cover and leave until firm and cool enough to handle. Shape the mixture into 14–16 croquettes, weighing around 50g/2oz each. Put the flour, whole eggs and breadcrumbs into three separate shallow bowls and beat the eggs. Dip each croquette in the flour, pat off any excess, then coat in the egg before dipping in the breadcrumbs. Transfer to a baking tray, then leave to cool to room temperature.Preheat the oven to 200C/180 Fan/Gas 6. 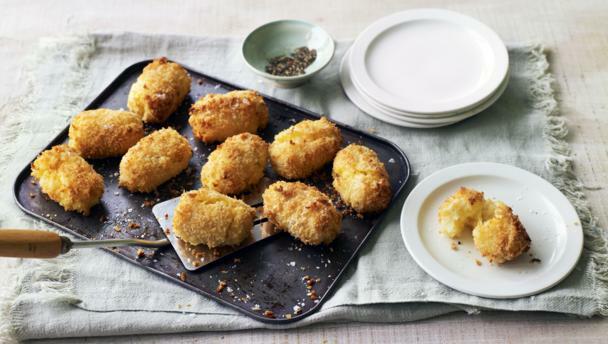 Drizzle the croquettes with oil and bake for 20 minutes, or until golden-brown.